Honor our Heroes, Celebrate their Greatness The Justice for Filipino American Veterans (JFAV) and Search to Involve the Pilipino Americans (SIPA) cordially invite the public for their very first Philippine National Heroes Day Celebration in the United States on Monday, August 30, 2010. The commemorative event will be held on Monday, August 30, 2010 at the Search to Involve Pilipino Americans (SIPA) Community Hall, 3200 W. Temple St. Los Angeles, CA 90026 around 6;30 PM. 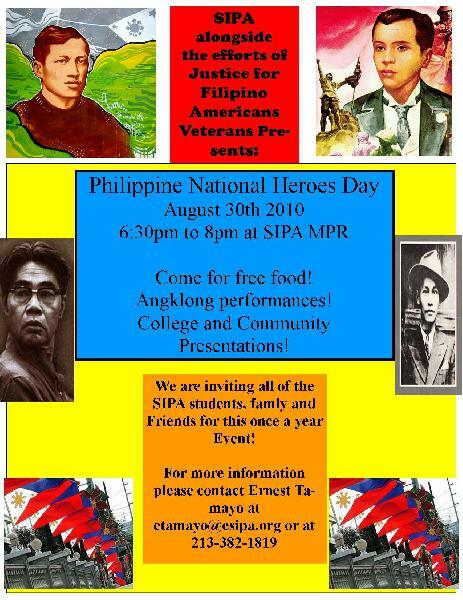 The Justice for Filipino American Veterans (JFAV) and Search to Involve the Pilipino Americans (SIPA) cordially invite the public for their very first Philippine National Heroes Day Celebration in the United States on Monday, August 30, 2010. The commemorative event will be held on Monday, August 30, 2010 at the Search to Involve Pilipino Americans (SIPA) Community Hall, 3200 W. Temple St. Los Angeles, CA 90026 around 6;30 PM. The guest speakers are President Protem of the Carson City Council Elito Santarina. ; Philippine Consul General Mary B. Aragon and Ryan Carpio. Remembering The August Events, August 23- 29, 1896. This will the first celebration of Philippine National Heroes Day in the United States . As a day to honor Filipino heroes who built the Filipino nation. National Heroes Day is national holiday in the Philippines since 1931. The Philippine legislature passed this law to commemorate the seminal events from August 23 to August 29, 1896. On August 23, 1896, the Cry of Pugadlawin took place in Balintawak. On August 29, the first battle between the forces of the Katipunan and Spanish forces occurred when the Filipinos attacked the Spanish garrison in San Juan. It was called th e Battle of Pinaglabanan. For JFAV It is an opportunity for us to introduce our heroes to the Filipino American youth in our community. College students and young Filipino-Americans who are in SIPA’s after-school program together with Filipino World War II veterans and widows will do this intergenerational event. The College students and youths will give numbers so as the Filipino World War II veterans. This event is supported by JFAV, SIPA, AWARE, Kabataang maka-Bayan (Pro People Youth KMB), BANTAY PILIPINAS PROJECT, XPO CalPoly Pomona, Kappa Psi Epsilon .